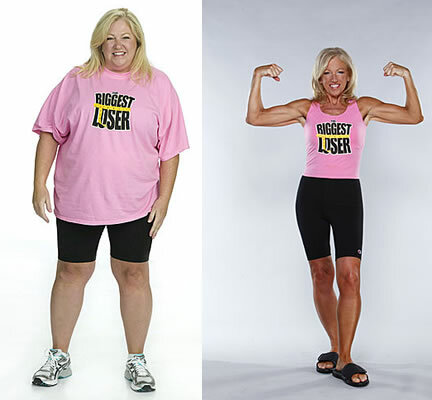 Over the past few years, I've always heard about how inspirational the show The Bigger Loser is, but it wasn't until this last year that I truly understood why. Olivia, Season 11's Winner. HOW INSPIRING! So incredible. YOU CAN DO IT TOO!!! The cherry on top is seeing their confidence grow throughout the season. Part of my platform, Fit For Success, is motivating kids to develop healthy lifestyles in order to be more confident about themselves! I firmly believe that more confidence leads to more self-esteem, which ultimately leads to more success! 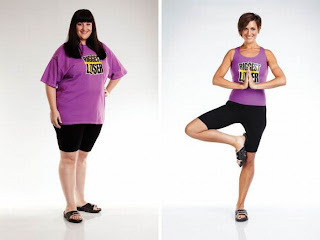 The Biggest Loser contestants are perfect examples of this. Nutritious lifestyles can truly lead to more happiness, so my goal for you is to experience this same feeling!! Here is a "Biggest Loser" recipe I've been dying to try! Preheat the oven to 450°F. Preheat a grill to high heat. Sprinkle the seasoning and garlic powder evenly over the chicken. Place the chicken on the grill rack. Reduce the heat to medium. (If it is not possible to reduce the heat, cook the chicken away from direct heat.) Grill for 3 to 5 minutes per side, or until no longer pink and the juices run clear. Transfer to a cutting board and let stand for 5 minutes. Chop the chicken into bite-sized pieces. Set aside. Meanwhile, place the pita on the grill rack. Cook for 1 to 2 minutes per side, or until lightly toasted. Place the pita on a nonstick baking sheet. Spread evenly with the hummus. Top evenly in layers with the beans, the reserved chicken, onion, red pepper, tomato, cilantro, and cheese. Bake for 6 to 8 minutes, or until the cheese is melted. Let stand for 5 minutes. Transfer to a serving plate. Slice into 4 wedges. 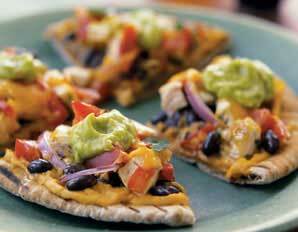 Top each wedge with a teaspoon of guacamole or sour cream, if desired. Best part of The Biggest Loser: Bob. Update me on your workout journeys, I love hearing everyone's stories and forms of inspiration!